The PPI Calculator finds pixels per inch (PPI) and pixels per centimeter (PPcm). It will calculate PPI when inches are entered and calculate both PPI and PPcm when centimeters are entered. PPI is a measure of pixel density or resolution of a computer screen, television screen or other display device. Pixels per inch or PPcm indicates how many pixels are in a 1 inch line or 1 cm line on a display. Also calculated are dot pitch, diagonal in pixels and total number in megapixels. The number of pixels per inch or PPI tells you how many pixels are in a 1 inch line on a display screen. The PPI will be the same whether it's a horizontal or vertical or diagonal inch because pixels are square and therefore symmetric. If a display does not have square pixels then this calculator does not apply. You can use the same PPI formula above to calculate pixels per centimeter, PPcm. Just substitute cm for inches to find PPcm. Multiply PPI × PPI to get pixels per square inch. The number of pixels in a square inch represents the resolution or pixel density of an area of one square inch. Substitute 1 cm for 1 inch to find pixels per square centimeter or PPcm2. You have a computer screen that is 1920 pixels wide by 1080 pixels high. The diagonal is 10 inches. You want to find the pixel density in one linear inch of display. So there are 220.29 pixels in a 1 inch line on the display. So there are 48528 pixels in an area of the screen that is 1 inch wide by one inch high. 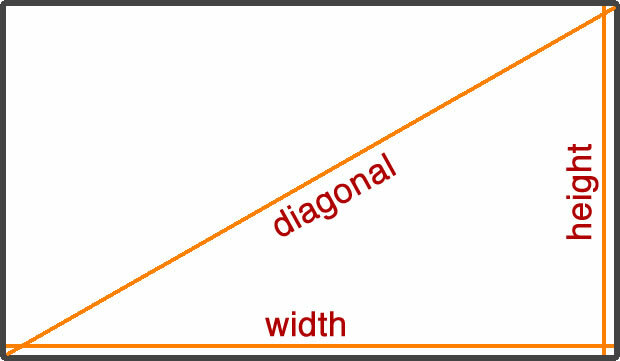 Diagonal dot pitch is the diagonal distance from the center of one pixel to the center of the next. Dot pitch is calculated from the diagonal length in inches and pixels then converted from inches per pixel to millimeters per pixel but normally only expressed in millimeters (mm). If a screen diagonal is 15.4 inches and has 3396 pixels. Dot pitch = (15.4/3396) × 25.4 &approx; 0.1152 mm. Furey, Edward "Pixels Per Inch PPI Calculator"; from https://www.calculatorsoup.com - Online Calculator Resource.